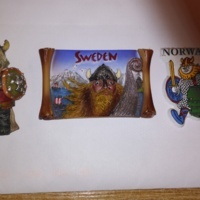 A small boat named Oden, with a stylised Viking head with beard and horned helmet. 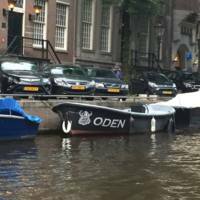 Seen on the canal in central Amsterdam. 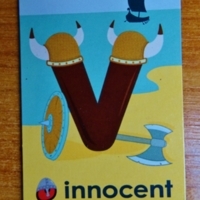 A small boat named Viking, with a stylised Viking head with beard and horned helmet. 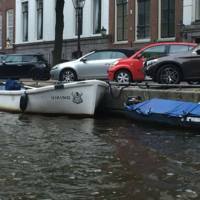 Seen on the canal in central Amsterdam. 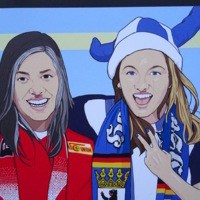 A billboard for the new Underground line in Berlin, featuring a Hertha (Berlin football team) supporter with a Viking style supporter's hat. 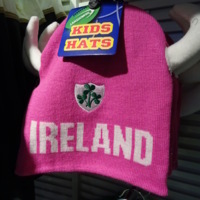 A 'Viking' style Irish horned hat from Landsdowne Kid's Hats, seen in Dublin airport. 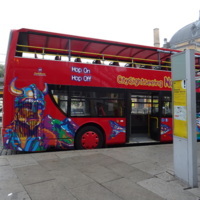 One of the few examples of appropriation of Viking and Norse culture at a national level. 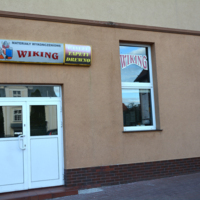 'Wiking' is shop with building materials (e.g. 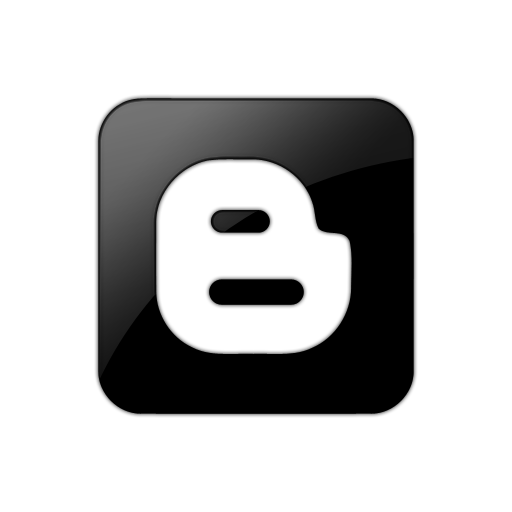 paints, plasters, panels, wallpapers) located in Wolin, Poland. 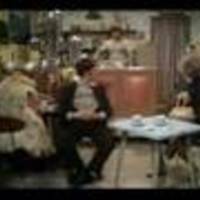 A clip from Monty Python's Flying Circus involving spam-loving vikings with horned helmets! 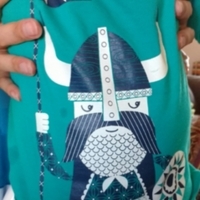 T-shirt from Marks and Spencer (wearer is a one year old). 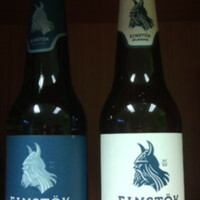 Ales produced by Einstök ölgerð, and featuring a viking with beard and horned helmet on the label (the Einstök logo). 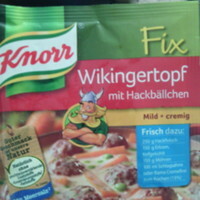 A powdered sauce for meatballs produced by Knorr for the German market, and branded as a 'Viking Dish'. 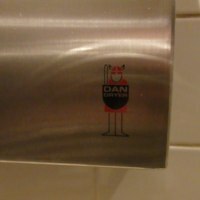 A hand dryer in the Tivoli Gardens, Copenhagen. 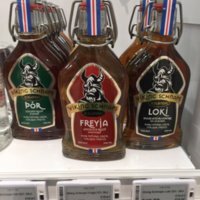 The company uses a Viking warrior in the colours of the Danish flag as their logo. Naturally, the figure has a horned helmet. 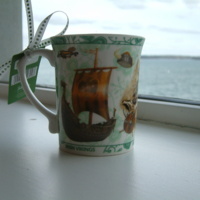 A mug labeled Irish Vikings with images of longships, a Viking, and no less than three horned helmets. 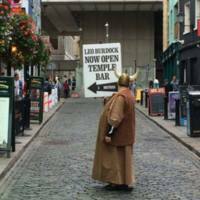 A promoter in Viking dress (with horned helmet) directing customers to Leo Burdock fish and chips in Temple Bar. 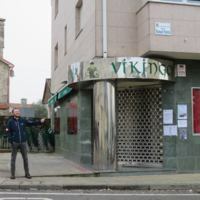 The restaurant appears to be capitalising on the Viking heritage of Dublin. 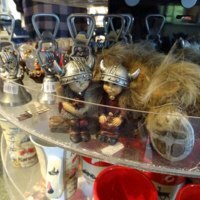 A pair of young Vikings in horned helmets sitting together on a log. 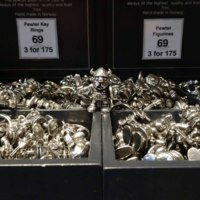 Pewter Viking figurines from Vikingskipshuset in Norway. 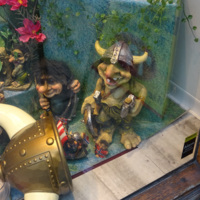 They have horned helmets and a full range of weapons.